There’s a lot of advice to share when it comes to sharing iPads in the classroom – I’m really hitting the tip of the iceberg here. I’ll have some more tips later, but this is a good place to start. Don’t be afraid to give up control to the kids. Most are familiar with this type of technology. 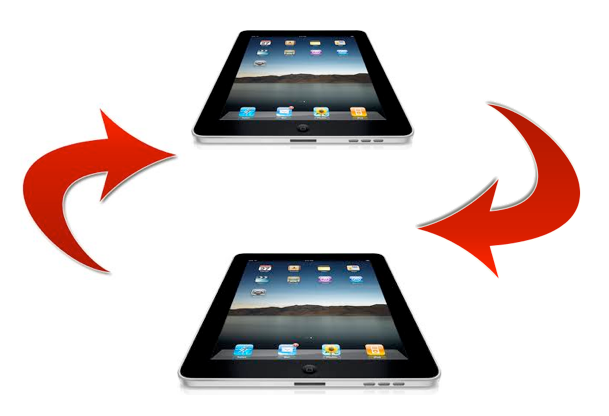 If they want to figure out an iPad function, they will – whether it is on their own or with help from a fellow student. Take risks. Have students create something you personally might not know how to do. You DO NOT need to be an app expert. Answer questions on content, refer the tech questions to the students. Do NOT have a tech week/teach kids all about the iPad. Have students use/explore Apps as you need them. Tech boot camp can overwhelm everyone (you included) – and the students will forgot half of the things they learned if they aren’t immediately applying them meaningfully. When using an App (iMovie, GarageBand, Keynote, etc) DO give the kids “play” time to learn the App. Better yet – try “guided playtime” if you now they’ll be using the app often. Identify your Tech leaders/all-starts and write their names on the board. They will be the Apple Geniuses for Tech Help. Discuss proper tech usage. Getting off task/taking advantage of the device is really no different than a kid spacing out or doodling in a notebook. Discipline like you would for anything else – loss of iPad privileges etc. Determine how students will share their work. I recommend individual student Google Apps accounts and gClass Folders. Is your school not Google? Contact your technician/Tech Director – Google Apps for schools is free, and they can set it up. You can also just create a Dropbox account or a shared, free Google Apps account to use with the class. Get an Apple TV, and teach students how to use it to showcase their work. Inform students NOT to play with the iPad settings, primarily adding a lock code to the device. (You may want to add a lock code to prevent the installation/deletion of apps).